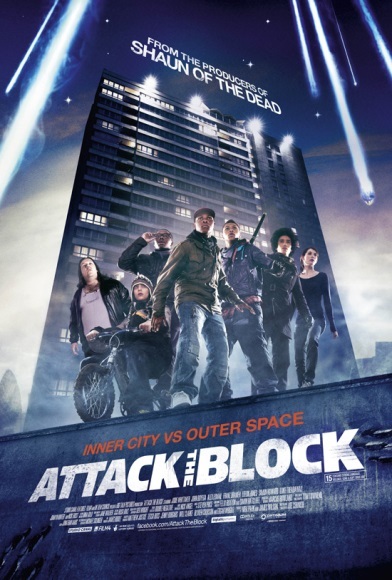 Attack the block (2011) | Oh! The Terror! England? Check. Angsty Inner City Teenagers? Check. Ominous and impending alien invasion? Check. Get ready for Awesome. I dug up this gem bout two years ago after looking through alien designs on the google. Now, that’s what drew me in, but the premise was what kept me for the whole ride. Take A nurse and a group of Vandals and a couple drug dealers(one of which is Nick Frost) and subject them to an onslaught of carnivorous aliens with glow in the dark teeth. Sounds fun right? It is. The cast and characters are a nice diversity and pretty well written, though at times they can be a but silly, either on purpose or by accident. The plot is simple enough—it’s a tale of Unity overcomes adversity – Which leaves a lot to be covered by character interaction, dialogue and action. Fortunately, these are all handled very well, making the movie entertaining and well managed. Given the spotty pacing in the beginning and the somewhat melodramatic ending, the overall experience is decently entertaining. There’s a fine sense of justice and morality in the movie, even if it seems a bit skewed at times. With a happy amount of humor, the movie maintains a good balance, allowing for a contrast to make the action serious and the dialogue amusing. By far my favorite part of the movie was the effects, most of which were practical. There’s a bit of gore for those who’re squeamish, and all the aliens are animatronics and costumes with only a bit of visual effects. Those are mostly unnoticeable or small enough not to distract from the focus of the frame. All in all, the movie was a great ride, even though at some points it slowed down, and the characters were a bit hard to relate to at times.